I have a Mills HI-TOP 10 cent 5 and 2 cherry inspected in 1946 (serial # scratched). It works pretty well; getting new springs for payout. I have two questions semi-related and will post separately. There’s an overflow function I don’t understand. I have an overflow pushoff bar that shoves dimes into the jackpot fill area when the payout tube is completely full. However, there is a deflector that is above the tube that extends and retracts over the tube opening. There is a push rod on this deflector that sticks out the back through the upper finger bracket. You can push and pull this rod to extend and retract the deflector. There is a level detector bar that is about ¾ up the payout tube that goes in a slit in the rear of the tube. If the dime fill level is low, the detector is in the tube; if high, it is pivoted out of the tube. If the fill level is high and you push the deflector rod to extend the deflector over the tube, it catches on the fill level detector mechanism and locks in place. All the coins will deflect and go into the jackpot area. At this point, you cannot pull the deflector rod back; it’s locked. Once there is enough payout and the fill level drops and the level detector bar retracts, the deflector is released and it also retracts, allowing coins into the tube again. I don’t think the deflector gets deployed except by hand pushing the rod in the rear. So, is this to force fill the jackpot? If you push it, fill the jackpot, then resume play, as soon as the payout tube level goes down the deflector is released and spring pulls it back. Am I correct? If so, what are the official names of these parts? Thanks. This was a concern because the deflector was not retracting automatically and keeping the tube from filling. I managed to slightly loosen the pivot screw in the middle of writing this up and now it retracts automatically. But still curious of the function. As you noticed this particular lever works on a balance principle and is rather free moving! Not sure on the Mills manufacturing part name or part number but it is an added function to maintain a balance between the front jackpot filling and the coin tube so theoretically the coin tube will never run dry while maintaining the front jackpot filling! Kind of a redundancy thing as the regular coin deflector directs coins to the jackpot when the coin tube is full as you probably already know! More to keep an adequate amount of coins in the jackpot but probably someone else may have more information or a better explanation! Thanks for the note, Monti. Mine has a spring at the bottom of the arm that should keep it away unless pushed with the rod. Howevever I think the thing did extend during play by itself but it may have been pushed when pressing payout fingers due to no springs. Kids wanted their dimes. Now I have a better understanding and springs so we will see in the future. After playing around I discovered that the coin deflector moves to cover the payout tube when the jackpot is hit. 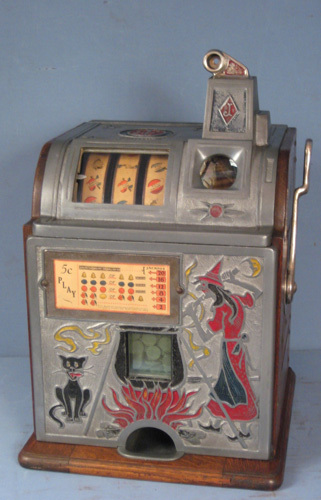 The point is to quickly fill the jackpot even if the payout tube is not full. If the payout tube is low, ie below the level indicator, the deflector will retract on the next pull and allow the tube to fill. If the payout tube is not low, the deflector will remain in place, filling the jackpot, until the payout gets low and then retracts. Cool! The whole purpose of this system is to fill the jackpot quickly and this senses when the tube is half full and then the deflector moves over the coin tube so the coins can fill the jackpot . Many times the whole jackpot deflector mechanism is frozen and is not working. A lot of the time this whole system was removed when the machine was serviced . 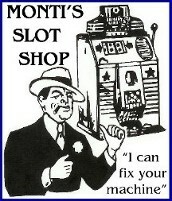 This system is not necessary on a home use machine and you can manually fill a jackpot when the mechanism is removed. When I repair a machine however, I like to leave these parts on the mechanism and all the anti-cheat parts as removing any of the original parts just seems to make the machine less than original. If you remove the reel bundle from the mech, you have access to all of the system and can lubricate the levers so they all work. It is getting harder to find machines that still have all of their original parts as a lot of operators removed them over the years to avoid downtime on their machines.